By reading my last post about my online shopping experience you must have concluded that how big of a shopaholic I am. I was on a huge shopping spree for all the time I was in India and bought so many ethnic wears, western wear, accessories, make up, shoes, kitchen and home goods. I am planning to share all those hauls soon with you all on my YouTube Channel as well as here on my blog. 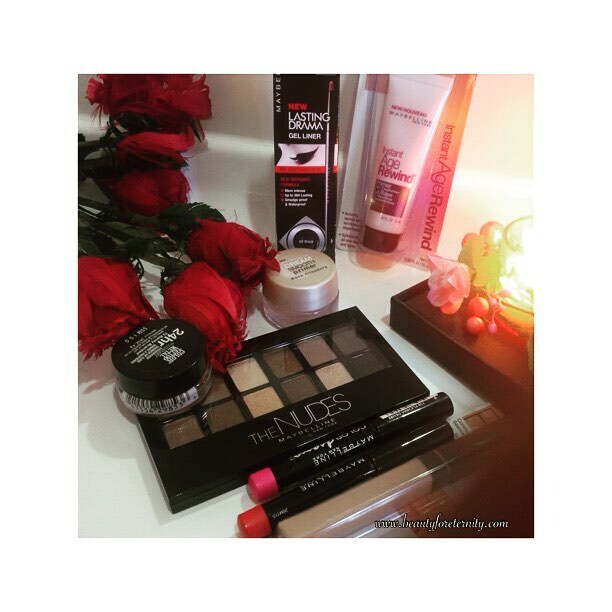 Few days back Priceline , which is a drugstore/pharmacy in Australia and sells health supplies, hair products, skincare products, make up and a lot of other awesome stuff, had a flat 50% off sale on all the products from Maybelline. Right, it seems hard to believe but it's true. All the products were marked down to half of their actual price. Make up is ridiculously expensive here in Australia and it's not easy to always afford even the drugstore brands here. So, without wasting a m.
inute I headed straight to Priceline at Westfield at Mount Gravat in Brisbane. I picked up a lot of stuff. Yes, I went crazy..and I think it's pretty normal for a beauty blogger. 3. Maybelline Color Drama Lip Crayon - Shade Fuchsia and Coral Orange - Both of these are very bold and bright colors which are appropriate for this spring season in Australia. Price $9.95 each. These are the items that I managed to grab from that 50% off sale and I am happy that I got some really awesome stuff. The prices that I have mentioned above are te actual prices and I paid only half of this amount. I will post the detailed reviews and swatches of all of these, one by one on my blog as well as YouTube so keep following me to check those out. You can buy all these items by clicking here but now these are on full price. However you can still go for the offer "Buy 3 for 2" in which you can buy 3 items but you will have to pay for the 2 highest priced items only. Which one of these is your most favourite ? Which one would you like me to review first ?